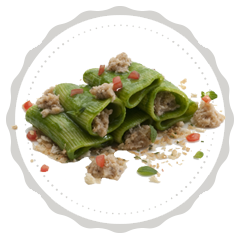 2 fillets Aringa Sciocca, 2 oranges, 2 celery stalks, 8 walnuts (shelled), salt, pepper, extra-virgin olive oil. Thinly slice the low-salt herring, keeping the knife at an angle so as to cut wide slices. Cut the orange into segments, removing all the pith and membranes. Wash the celery, cut the stalks into 10cm-long pieces then slice them into thin strips lengthwise. Dress the celery with oil, salt and pepper. Arrange the dressed celery strips in the middle of the plate. Top with alternating rows of low-salt herring and orange segments. Drizzle a little oil over, garnish with the walnuts and serve. 1 jar Sapor di Trota, 280 g paccheri tube pasta, 1 shallot, 200 g borage, 60 g dry bread, 20 g butter, salt, pepper, extra-virgin olive oil, 1 sprig of thyme, 1 sprig of rosemary, 1 sage leaf, 1 garlic clove. Cut the crusts off the dry bread and grate it on a coarse grater to get coarse crumbs. Strip the thyme and rosemary sprigs and chop the leaves finely with the sage. Heat 2 tbsp of oil in a non-stick pan and gently fry the garlic clove. As soon as it becomes golden brown, take the clove out and tip in the chopped herbs and the breadcrumbs. Allow the breadcrumbs to toast until crisp, remove from the heat. Wash the borage. Peel the shallot and chop it finely. Cook it to golden brown in a pan with a drizzle of oil and a pinch of salt then add the borage. Allow the leaves to wilt, moisten with a few tablespoons of vegetable stock, season with salt and pepper. Tip the contents of the pan into a blender and whiz to a cream. Pour the purée into a non-stick pan. Pour the jar of Sapor di Trota into another, small saucepan and warm through. Cook the paccheri in plenty of salted boiling water. Drain “al dente” then toss the pasta in the pan with the borage purée. Add the butter and a drizzle of extra-virgin oil, toss the pan until the butter has melted and the pasta is well coated in the creamy sauce. Sprinkle herby toasted breadcrumbs over the bottom of the plate. Arrange the paccheri sautéed in borage purée in the centre. Top with a few spoonfuls of Sapor di Trota. Finish with a generous sprinkling of herby breadcrumbs and garnish with diced fresh tomato. Serve immediately. 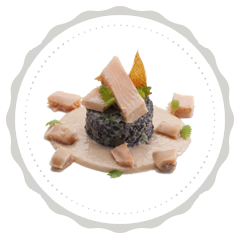 2 fillets Trota Chef al Naturale, 16 Guanciali di Trota, 4 tbsp Uova di Trota, 4 small bunches mixed young salad leaves, primula petals, 1 small potlow-fat plain yogurt, 1 tray of soy bean sprouts, 1 small bunch curly parsley, 1 small bunch watercress, 120 g crescenza cheese, groundnut oil, Maldon salt, extra-virgin olive oil. Wash the salad leaves, bean sprouts, watercress and parsley and dry them in kitchen paper. Break the parsley into tiny sprigs and deep-fry them for a few seconds in groundnut oil. Drain on kitchen paper. Break off the watercress leaves. Cut the crescenza into a 1cm dice. Coarsely chop the trout fillets. Arrange the fresh vegetables at random on a dinner plate. 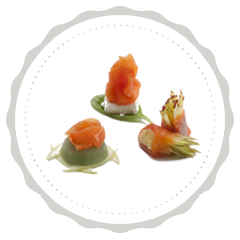 Arrange on the top, equally randomly, a few pieces of trout fillet, 4 trout cheeks, the cheese dice and the bean sprouts. Dress with a few drops of plain yogurt, a few drops of extra-virgin oil and a few salt crystals. 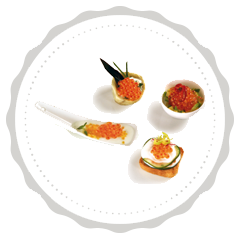 Garnish with a scattering of primula petals, fried parsley sprigs and rainbow trout eggs. 250 g couscous, 180 g Trota Regina, 2 perfectly ripe avocados, 2 cucumbers, extra-virgin olive oil, salt, pepper, lemon juice. Bring 250 ml water to the boil with a pinch of salt and 2 tbsp of oil. Tip the couscous into a bowl and pour the boiling water over. Leave it for a few minutes to absorb all the water then fluff it up with a fork. Cut four medium-thick slices of Regina trout and wind them around a finger to form a rose. Cut the remaining trout into a small dice. Peel the avocados, remove the pit and dice the flesh. Mix the couscous, trout and avocado and season with salt, pepper and extra-virgin oil. Remove alternate strips of cucumber peel then slice them very thinly. Dress lightly with lemon juice, salt, pepper and extra-virgin oil and extra-virgin oil. Cover the surface of the place with slightly overlapping cucumber slices. 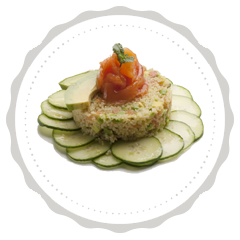 Place a food ring in the centre and fill it with the coucous salad. Press lightly with the palm of your hand (or with a tamper) so the couscous keeps its shape. 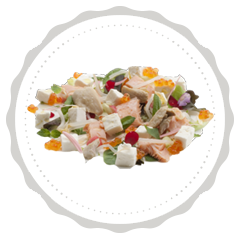 Remove the ring and place the Regina trout rose on top of the salad. Season with a little freshly-ground pepper and serve. For the pasta dough: 200 g 00 flour, 30 g durum-wheat flour, 150 g egg yolk, 15 g extra-virgin olive oil, 7 g salt, water. For the stuffing: 4 artichokes, 100 g fresh ricotta, 250 g Trota Chef agli Agrumi. For the sauce: 4 artichokes, 70 g single cream, salt, pepper. Prepare the pasta dough: knead the flours with the egg yolk, oil and salt and add enough water for a firm, elastic dough. Wrap it in clingfilm and leave it to rest for at least an hour. Meanwhile, prepare the stuffing. Wash and trim the artichokes, cutting off the tougher leaves. Cut in half, remove the choke. Trim the stems, removing the outer layer. Finely slice the hearts and stems and cook in a non-stick saucepan with a drizzle of extra-virgin olive oil, salt and pepper. Add a little vegetable stock occasionally if the mixture gets dry. When the artichokes are cooked transfer half to a bowl and add the ricotta and the roughly-chopped citrus-flavoured Trota Chef. Mix thoroughly and adjust the seasoning. Roll out the pastry to ½mm thickness. Using a round pastry cutter make discs of 7-8 cm diameter. Brush them lightly with beaten egg and spoon a little trout-and-artichoke filling into the centre. Fold over the dough into a half-moon shape and seal the edge carefully. Cook the tortelli for 3-4 minutes in salted boiling water, drain them and cook them gently in a frying pan with a knob of butter. Prepare the sauce. Add the remaining cooked artichokes to the single cream with a ladleful of vegetable stock. Bring the mixture to the boil and purée with a stick blender. Strain through a chinois sieve then place back on the heat. Thicken the sauce by adding a teaspoon of cornflour dissolved in a little cold water and whisk it in. Pour a thin layer of artichoke sauce in the centre of the plate. 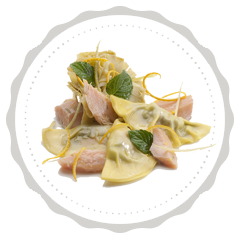 Arrange the Chef trout and artichoke-filled tortelli on top. 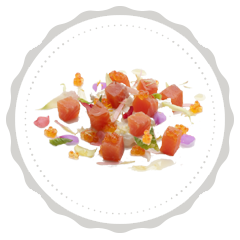 Add a few tiny chunks of citrus-flavoured Chef trout and garnish with julienne strips of lemon and orange zest and a few mint leaves. Slice some Regina trout, not too thinly, place each slice between two layers of clingfilm and flatten them slightly using a meal mallet, taking care not to break the slices. Cream the fresh goat’s cheese with a tablespoon of extra-virgin oil and a teaspoon of chopped parsley. Place a teaspoon of filling and a crushed Szechuan peppercorn in the centre of each trout slice. Close each slice like a parcel and, if you like, tie each one with a stem of chive or a thin strip of leek blanched for a few seconds in boiling water then immediately cooled in iced water. Slice some Regina trout. Remove the mango’s large stone and cut the flesh into matchsticks. 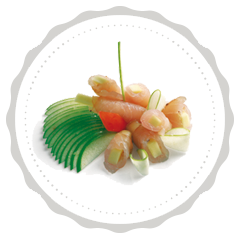 Place some mango matchsticks at one end of each trout slice and roll the slice up. Trim the ends and slice each roll in half with a diagonal cut. 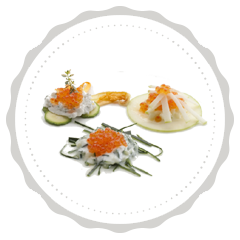 Arrange the two pieces on a finger-food plate, garnish according to taste and serve. 280 g mezze maniche short tube pasta, 2 eggs, 130 g Trota Regina, 30 g whipping cream, 300 g white asparagus, 1 shallot, 40 g grated cheese, chopped parsley, extra-virgin olive oil, salt, pepper. Wash the asparagus, peel them and snap off the woody part of the stems. Slice them into thin rounds, leaving the tips whole. Chop the shallot and sauté it in a pan with a drizzle of oil. Add the asparagus slices and tips and continue cooking. Season with salt and pepper and add some vegetable stock if the mixture gets dry. Cook the asparagus “al dente”. If they are too watery, thicken the cooking juices with a teaspoon of cornflour dissolved in a little cold water. Slice the Regina trout into a julienne. Beat one whole egg and one yolk in a bowl with the cream, salt, lots of pepper and the grated cheese. Cook the mezze maniche “al dente”, drain the pasta and tip it into the pan with the asparagus. Mix the pasta gently but thoroughly; turn the heat off and add the sliced trout, chopped parsley and egg-and-cream sauce. Mix quickly so the eggs do not cook. Put a portion of pasta in the centre of the plate. Sprinkle with lots of pepper and some grated cheese. Serve immediately. 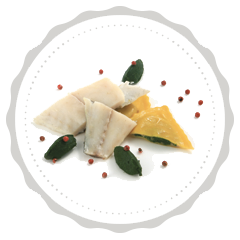 2 fillets Aringa Sciocca, 2 burrata cheeses weighing 100g each, fresh marjoram leaves, extra-virgin olive oil. Finely slice the low-salt herring fillet crosswise to obtain “ribbons”. Cut open the burratas and spoon the filling into a bowl then add the finely chopped “shells”. Season the cheese with extra-virgin oil and a few chopped marjoram leaves. Place the cheese in the middle of a plate in a rectangular shape, using a food stacking mould. 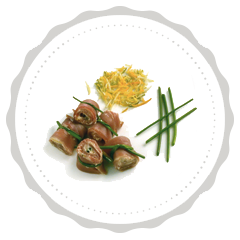 Arrange the low-salt herring ribbons over the cheese and garnish with a few fresh marjoram leaves. Drizzle a little extra-virgin oil and serve. 3 Fil di Fumo fillets, 160 g Venere rice, 80 g fresh crescenza cheese, 20 g lemon balm leaves, 1 125g pot low-fat yogurt, salt, pepper, extra-virgin olive oil. Bring lightly-salted water to the boil in a large saucepan, cook the Venere rice for 30 minutes, then take the pan off the heat and leave the rice to cool in its cooking water. Take half the lemon balm leaves and chop finely. Drain and dry the rice and tip it into a bowl. Add the crescenza, the chopped leaves and a pinch of salt and pepper. Mix well. Divide the mixture into 4 individual aluminium moulds and place them in the fridge to firm for about 2 hours. Empty the yogurt into a blender together with half a hot-smoked trout fillet. Add a few lemon balm leaves and a pinch of salt and pepper. Whiz everything to a smooth, velvety sauce. Roughly tear the remaining Fil di Fumo fillets into pieces. Pour the yogurt sauce onto the centre of the serving plates. Unmould a Venere rice timbale in the centre. Top with a few Fil di Fumo pieces. Arrange more fillet pieces around the timbale. Garnish with a few small lemon balm leaves. Drizzle a little extra-virgin oil over and serve immediately. 1 jar of Uova di Trota, 50 g fresh whipping cream, 50 g mayonnaise, 50 g ricotta, ½ green apple, few drops of lemon juice, 2 stems chives, 1 lime, 1 cucumber, 2 sprigs lemon thyme, salt, pepper, extra-virgin olive oil. Wash and peel the cucumber, remove the seeds and cut the flesh into a 3-mm dice. Whip the cream and sour it with a few drops of lemon juice. Season it with salt and pepper, adding the finely chopped chives and the diced cucumber. Peel and core the green apple and cut it into a small dice. Mix the mayonnaise and diced apple in a bowl and season with salt, pepper, a few drops of extra-virgin oil and a generous grating of lime zest. Strip the lemon thyme leaves from the stems and chop them. Add the chopped leaves to the ricotta and cream it with a few drops of extra-virgin oil, salt and pepper. Arrange on a plate a little mound of sour cream and cucumber, another of green-apple mayonnaise and a third of lemon thyme-flavoured ricotta. Top each little mound with a teaspoon of rainbow trout eggs. Serve with triangles of hot toast. 2 burrata cheeses weighing 200g each, 1/2 jar of Uova di Trota, 200 g Trota Regina. Edible flower petals: rose, daisy, violet, primula, calendula. Salt, pepper. For the herb-flavoured oil: 1 garlic clove, 1 bay leaf, 1 rosemary sprig, 1 thyme sprig, 3 sage leaves, 150 ml extra-virgin olive oil. Prepare the herb-flavoured oil. Finely chop the bay, sage, rosemary and thyme leaves. Mix in a bowl with the crushed garlic clove and cover with extra-virgin oil. Heat in a microwave oven to a temperature of 40°C. Leave the herbs to infuse until the oil is cold. Cut open the burratas and pour the mozzarella strips into a bowl. Dice the outer mozzarella shell and add it to the strips, mixing gently. Season with two tablespoons of herb oil and a pinch of salt and pepper and mix gently. Skin the Regina trout fillet and cut it into a 1-cm dice. Pluck the edible petals and tear the larger ones by hand. Place a few tablespoons of mozzarella in the centre of the plate. Arrange randomly the cubes of Regina trout over the mozzarella. Alternate the trout dice with a few teaspoons of rainbow trout eggs. Garnish with the edible flower petals. Season with freshly-ground pepper and a drizzle of herb-flavoured extra-virgin olive oil. 2 eggs, 5 tbsp plain flour, 3 dl milk, 60 g smoked salmon, 1 small leek, 40 g butter, 100 g ricotta, parsley, nutmeg, salt, pepper, tarragon. Beat the eggs with 4 tbsp of the flour. Dilute with 1 dl of milk, season with salt, pepper and nutmeg and leave to rest for 30 minutes. Melt 20g butter in a saucepan, stir in the last tablespoon of flour and dilute with the remaining milk. Season the white sauce with salt and pepper and simmer for 5 minutes. Gently fry the sliced leek with a knob of butter. Mix the ricotta with a tablespoon of chopped herbs, add salt and pepper. 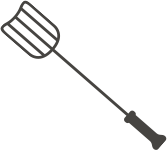 Make four pancakes (crêpes), spread a thin layer of ricotta over each one followed by the cooked leek and rolled-up salmon slices. Fold the pancakes, cut them into wedges and arrange them in a buttered baking dish. Pour the white sauce over them. Brown in the oven at 200°C. Crackers, slices of smoked salmon, onion, butter, lemon juice and vodka. Butter the crackers, cover them with slices of salmon. Garnish with very thin onion slices and moisten with a few drops of lemon juice and vodka. Dust with a tiny pinch of black pepper. Serves 6: 3 potatoes approx. 350g, 300 g smoked salmon, 100 g butter for cooking and a few curls for garnish, olive oil, chives, leaves of curly endive, salt. Peel and wash the potatoes and slice thinly. Heat the butter and a tablespoon of oil in a frying pan. Cover the bottom of the pan with slightly-overlapping potato slices. Place a portion of potato on each plate and decorate with one or two leaves of curly endive. Arrange four slices of smoked salmon on the potatoes and garnish with butter curls and chopped chives. Serve immediately. 4 fillets Trota Chef al Naturale, 200 g Pachino tomatoes, 1 tbsp Taggiasca olives, 1 pinch oregano, a few fresh basil leaves, 1 pinch ground chilli pepper. Wash the tomatoes and slice them into segments. Cook them for a few seconds in a drizzle of extra-virgin oil in a non-stick pan, stirring occasionally, then add the Taggiasca olives and season with salt and pepper. Tear the basil leaves into pieces with your fingers, add the basil to the pan with the oregano and ground chilli pepper. Lastly, add the coarsely chopped Chef trout fillets and leave them to absorb the flavours of the sauce for a few minutes. Serve the trout in its Mediterranean sauce on a soup plate. Season with some freshly-ground pepper and a drizzle of oil. On a bed of yogurt and candied orange peel. On a bed of diced avocado and with a slice of grilled sweet pepper. Seasoned with a drop of lemon juice. Boil a small artichoke, drizzle with a drop of sour cream, garnish with chopped chives. Top with Uova di Trota. On a small square of toasted bread build layers of a thin cucumber slice and a drop of sour cream. Repeat twice then garnish with Uova di Trota. Prepare a julienne of Regina trout. Strip black and white grapes from two bunches, wash the grapes and cut in quarters. Arrange the Regina trout on top of the grapes, drizzle over a little oil and serve. Beat some eggs and add chopped mixed fresh herbs. Make thin omelettes filled with slices of Regina trout then roll the omelettes up. Cut the omelette rolls into bite-sized slices and serve them on a bed of lamb's lettuce and a few slices of Pachino tomatoes. Wash the fennel bulbs and cut the thicker outer layers into a diamond shape. 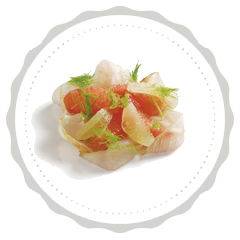 Place a slice of Regina trout in each fennel "boat" with an orange segment trimmed of all the membrane. Drizzle a little oil over and serve. 4 slices smoked tuna, 90 g trout pâté, 100 g fresh robiola cheese, juice and zest of 1 lemon, small bunch chives. Whiz the robiola and pâté briefly in a blender to a smooth cream. Leave aside four chive stems for tying the parcels, chop the others with scissors. Add the chopped chives to the cream together with the juice and zest of half a lemon. Season with salt and pepper and mix well. 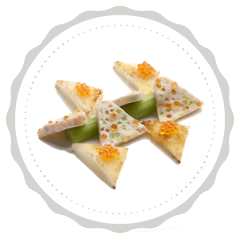 Arrange a teaspoon of cream on each smoked fish slice, roll the slices up and tie them with a chive stem. Garnish with the chopped zest of the remaining lemon half. Serve with a fennel and artichoke salad. 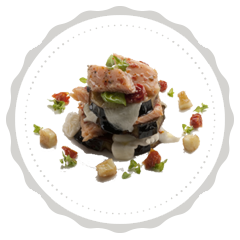 Serves 4: 3 round aubergines, 3 fillets Trota Chef alla Mediterranea, 150 g cooking mozzarella (low moisture), 200 g dried cherry tomatoes in oil, a few fresh oregano leaves, plain flour, groundnut oil for frying, salt. Cut the stalk off the aubergines, peel them in alternate strips then cut into 1cm-thick slices. Place the slices in a colander, sprinkle salt over them and leave them for an hour to lose any excess moisture. Pat the slices dry with kitchen paper, coat them lightly with flour and deep-fry them in plenty of hot oil. Turn them over in the oil and remove them when golden brown. Drain on kitchen paper. 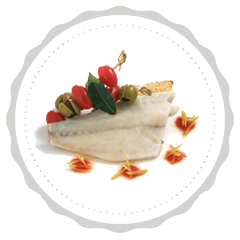 Dice the mozzarella and coarsely chop the Mediterranean-style Chef trout fillets. Drain the dried cherry tomatoes, dry them on kitchen paper and cut into thin strips. Assemble the parmigiana in a buttered baking dish: cover the bottom with slices of fried aubergine followed by a handful of diced mozzarella and a tablespoonful of dried-tomato strips. Arrange over these a few pieces of Mediterranean-style Chef trout and a few fresh oregano leaves. Repeat these layers until all the ingredients have been used up. Finish with a layer of aubergines and diced mozzarella. Oven-bake at 180°C for 20 minutes or until the mozzarella topping has melted and turned golden brown. Remove the aubergine parmigiana from the oven and leave to rest at room temperature for 20-25 minutes. Cut into portions and serve lukewarm, garnish each plate a few fresh oregano leaves. Drizzle a good extra-virgin olive oil over and serve. Prepare a julienne of unpeeled green and red apples and arrange it on a plate. 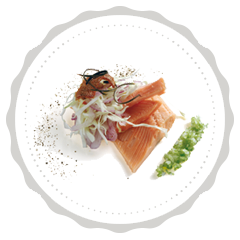 Place a trout cheek on top and garnish with a few strips of leek deep-fried in semi-hot oil. For the choux buns: 200 g water, 100 g butter, 130 g flour, a pinch of salt, 1 heaped tbsp finely chopped parsley, 4 medium eggs. For the filling: 300 g Baccalà Mantecato. Bring the water to boil in a large saucepan with the butter and a pinch of salt. At boiling point, take the pan off the heat and immediately tip in all the flour in one go then beat vigorously until it has absorbed all the water. Put the pan back over the heat and cook the pastry for 2-3 minutes until it forms a ball and leaves the sides of the pan clean. Beat the eggs well then gradually add them, a little at a time, beating well. Beat each addition in thoroughly before adding more egg. Lastly, beat in the parsley. Transfer the mixture to a piping bag and pipe the dough into well-spaced small buns on a buttered baking sheet. Bake, preferably in non-fan oven, at 190-200°C for 20-25 minutes, until the buns are puffed, golden and dry inside. Remove from the oven and leave to cool. Cut them in half horizontally. Fill the bottom half of each bun with a teaspoon of creamed salt-cod then cap with the top half. Serve the buns in paper cases. Serves 4: 300 ml water, maize meal for polenta, 250 g Baccalà Delicato, 70 g dried tomatoes in oil, 40 g small capers, salt pepper. For the sauce: 50 g Baccalà Delicato, 60 g milk. Bring the water to the boil, add a pinch of salt. Gradually whisk in the maize meal, enough to make a stiff polenta. Cook the polenta for 30 minutes. Dampen the worktop with a clean, damp cloth and stretch a layer of clingfilm over it. Pour the polenta over the clingfilm and use a spatula to level it to ½cm thick. Leave until it is lukewarm. Meanwhile, drain the capers. Drain the tomatoes in oil and slice them. Using your hands, crumble the Delicate Stockfish over the polenta. Scatter the tomato strips and capers over the fish. When the polenta is cold, roll it up using the clingfilm to help you. Tighten the clingfilm around the polenta roll, seal the ends and leave the roll to set in the fridge for an hour. Take the roll out of the fridge after an hour and cut it into 1.5cm-thick slices. Arrange the slices in a buttered baking dish and brown in the oven at 160°C for 12-15 minutes. In the meantime, prepare the sauce. Bring the milk to boil in a saucepan with the 50g of delicate salt cod. Adjust the seasoning then whiz into a cream using a stick (hand-held) blender. Pour a thin pool of salt cod sauce over the centre of each plate. Place two slices of polenta roll on the sauce. Dust with chopped parsley and serve. 250 g Baccalà Mantecato, 2 green celery stalks, 40 g Uova di Trota, 60 g fresh whipping cream, 10 g gelatine leaves, salt, pepper, 1 small bunch parsley. Soak the gelatine leaves in plenty of cold water. Wash the celery stalks and cut them into a ½cm dice. Bring a small pan of water to the boil with a pinch of salt and a pinch of baking soda. Blanch the celery dice, make sure they stay crisp; drain and cool immediately in iced water. Finely chop the parsley. Put the creamed salt-cod in a bowl, add the parsley, celery, and rainbow trout eggs. Adjust the seasoning with salt and pepper then mix carefully. Bring the fresh cream to just under the boil then dissolve the well-squeezed gelatine leaves in it. Pour the hot cream onto the creamed salt-cod and mix carefully with a wooden spoon. Dampen the inside of a small loaf tin and line it with clingfilm. Pour the salt-cod mixture into the tin, level it off using a spatula and fold the edges of the clingfilm over to close. Put the tin in the fridge for at least 4 hours. When the terrine is set, unmould it and, leaving the clingfilm, cut it into thin slices. Remove the clingfilm from each slice and serve on slices of hot, baked polenta or toasted bread. 240 g Superfino Carnaroli rice, 20 g chopped onion, 2 dl dry sparkling wine, vegetable stock, 60 g grated Parmigiano Reggiano, Uova di Trota, salt and white pepper, fennel pollen for garnish. Gently cook the onion in oil and butter until translucent, do not let it brown. Add the rice and toast it for a few minutes, pour in half the sparkling wine and allow it to evaporate. Gradually add the boiling stock a little at a time, stirring often. When the rice is nearly cooked pour in the rest of the wine and complete cooking. Adjust the seasoning with salt and freshly-ground white pepper. Remove from the heat, add the butter and Parmigiano Reggiano and stir gently until the cheese has melted and the rice is creamy. 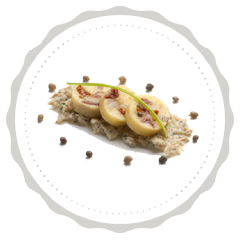 Put a serving of risotto on each plate and garnish with a tablespoon of trout eggs and a tiny pinch of fennel pollen. 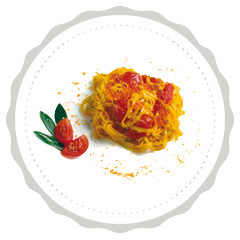 90 g Uova di Trota, 250 g linguine ribbon pasta, 20 g Bottarga di Trota, 20 cherry tomatoes, 1 garlic clove, sugar, oregano, white wine, extra-virgin olive oil, salt, pepper. Cut the tomatoes into quarters and sweat them in a pan with the oil and the chopped garlic clove. Add salt and pepper to taste, add the dried trout roe and mix. Meanwhile, cook the linguine in plenty of salted boiling water. Three-quarters of the way through cooking, drain the pasta and tip it into the frying pan. Toss with a little cooking water, add the rainbow trout eggs then toss again. Serve on a warmed plate, drizzle a little extra-virgin olive oil over and garnish with oregano. 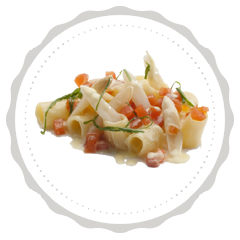 1 fillet Trota Chef al Naturale, 1 grapefruit, extra-virgin olive oil, 1 lemon, basil. Segment the grapefruit (cut off all the skin and pith then cut between the membranes to release the segments) and arrange them on a plate. Cut the Chef trout fillet in pieces and dress it with an emulsion of extra-virgin olive oil and lemon. Spoon the fillet and dressing over the grapefruit. Garnish with basil leaves. 4 fillets of Trota Chef al Naturale, Taggiasca olives, mixed fresh vegetables (fennel, Treviso radicchio), lemon, extra-virgin olive oil. Make a julienne of the fennel, dress it with oil and lemon and arrange it in the centre of the plate. 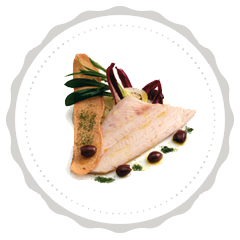 Place the Chef trout fillet on top and decorate with a triangle of wholemeal toast. Decorate with a few leaves of radicchio and the olives then drizzle over some olive oil. 1 fillet Trota Chef alle Erbe, 150 g vegetables (celery, carrots, French beans, sprouting broccoli), salt, pepper. Boil the vegetables – preferably seasonal ones, e.g. carrots, French beans, sprouting broccoli – chop them and sauté in a pan. 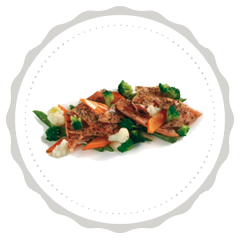 Warm the herb-flavoured Chef trout fillet by submerging the sealed pouch in hot water, then cut it into diagonal slices and arrange them on a plate with the vegetables. 1 fillet of Trota Chef salmonata alle Erbe, 2 potatoes, 1 small bunch of parsley, basil, extra-virgin olive oil. Wash and peel the potatoes, boil them, drain, then cut into a small dice. Dress with oil and parsley and arrange on the bottom of a plate. 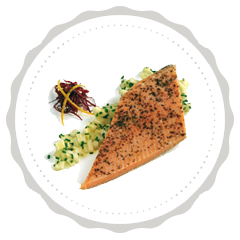 Lay the herb-flavoured Chef trout fillet on the bed of potatoes and season to taste by drizzling with an emulsion of oil and chopped basil leaves. The fillets may be served at room temperature or hot, according to taste. 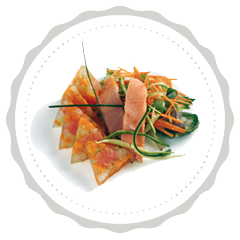 3 fillets Trota Chef salmonata al Naturale, 2 Tarocco oranges, 1 carrot, 1 courgette, 12 g gelatine leaves, salt, pepper. Soak the gelatine leaves in a bowl with plenty of cold water. Cut 2 of the 3 Chef trout fillets into an 0.5cm dice. Peel one of the oranges and dice it, making sure you remove all the membranes. Mix the trout and orange in a bowl and season with salt and pepper. Squeeze the other orange and heat the juice in a pan or in the microwave, do not allow it to boil. Squeeze the gelatine and dissolve it in the hot orange juice. Pour the liquid over the trout and orange, mix thoroughly then pour the mixture into a clingfilm-lined terrine mould or small loaf tin. Leave the terrine to set in the fridge for at least 8 hours. 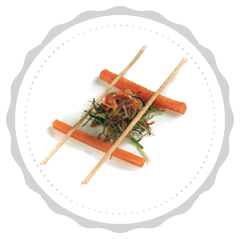 Unmould the terrine onto a plate, cut it into slices then decorate the plate with the two halves of the third fillet and a julienne of carrots and courgettes. Drizzle everything with extra-virgin olive oil and serve. 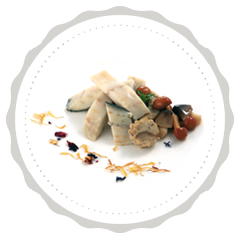 200 g Pesce Spada Affumicato, 2 ripe figs, extra-virgin olive oil, pepper. 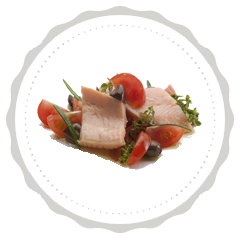 Slice the figs into segments and arrange them on a plate, alternating the segments with diced smoked swordfish. Dress with a splash of extra-virgin olive oil and a tiny pinch of pepper. 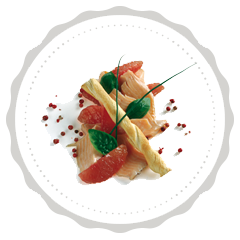 200 g sliced Pesce Spada, 1 white grapefruit, 1 red grapefruit, fennel fronds, extra-virgin olive oil. 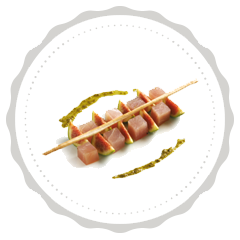 Arrange thin slices of swordfish to form a rose in the centre of the plate, drizzle over a little oil. Remove the peel and pith from the two grapefruit and cut out the segments, trim away the white membranes. 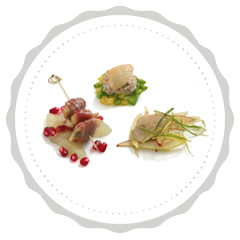 Arrange the segments over the swordfish and garnish with tufts of fennel fronds. 200 g sliced Pesce Spada, 1 green apple, 1 ripe papaya. Arrange thin slices of green apple in a fan on the plate. Cut the ripe papaya into matchsticks and wrap swordfish slices around them. 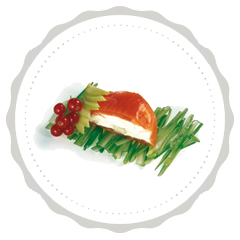 Arrange the swordfish-and-papaya rolls on the plate and decorate with more apple slices. 300 g Trota Regina, 1 jar Uova di Trota, chives, fennel fronds, garlic chives, 3 San Marzano tomatoes, extra-virgin olive oil. Finely dice the trout. Finely chop the chives, fennel fronds and garlic chives. Deseed the tomatoes and dice the flesh. Mix all these ingredients, add a drizzle of oil and the trout eggs. Serve directly on a plate or on top of toasted bread. According to taste, add a small dice of very fresh courgettes. Excellent with Basmati rice. 300 g spaghetti, 120 g Trota Regina julienne, zest of 1 orange, baby spinach leaves, 1 carrot, 1 celery stalk, extra-virgin olive oil, salt. Cook the spaghetti, drain then cool under cold running water. Tip the spaghetti into a bowl and toss with a little extra-virgin olive oil. Grate the zest of an orange, blanch it in boiling water for a minute, drain and leave to dry. 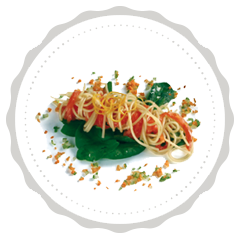 Mix the spaghetti with the julienne of Regina trout and arrange on the plate on a bed of fresh baby spinach. Complete with the fine-diced carrot and celery. Garnish with dried orange zest. 250 g Trota Regina, 200 g Granny Smith apples, 150 g fresh goat’s cheese, chives, celery, extra-virgin olive oil, salt and pepper. Wash, peel and core the apples and slice the flesh into matchsticks, transfer them to a bowl and dress with a drizzle of oil, a pinch of salt and a little pepper. Mix in the goat’s cheese and the finely chopped chives. Finely slice the Regina trout and line four dome-shaped moulds; allow the slices to hang over the edges. Fill each mould with the apple and cheese mixture, pressing lightly to eliminate any empty spaces. Cover the mixture with the overhanging trout slices and add more pieces of trout to cover any gaps. Cover the moulds with clingfilm and leave them to cool in the fridge for an hour. Slice the celery in julienne strips and dress with an oil-and-lemon emulsion. Make a bed of celery on four plates, place a Regina trout dome on each plate. Decorate with triangles of toast and slices of sautéed apple. Season with salt and pepper. 250 g Trota Regina, 1 yellow sweet pepper, 1 Tropea onion, 1 courgette, 1 aubergine, 1 celery stalk, extra-virgin olive oil, lemon. Slice the pepper, onion, courgette, aubergine and celery into julienne strips. Fry the vegetables, drain well on kitchen paper then arrange them in the centre of a serving plate. Cut the Regina trout into fingers and place them around the vegetables. Dress with extra-virgin olive oil and lemon. 2 fillets Orata al Naturale, 100 g fresh egg pasta, 100 g ricotta, 250 g fresh spinach, mixed herbs (sage, rosemary, thyme, marjoram, borage, pennyroyal mint, lemon balm), salt, pepper. Wash the spinach and cook in boiling salted water. Drain, cool, squeeze well and chop finely. Prepare the ravioli stuffing: finely chop the herbs and tip into a bowl, add the ricotta, salt and pepper. Roll out the fresh egg pasta, arrange teaspoons of stuffing, cover with another layer of pasta and cut the ravioli into the desired shape, seal the edges. Cook the ravioli in plenty of slow-boiling salted water. Put two ravioli in the centre of the plate, place steaks of gilthead on the top. 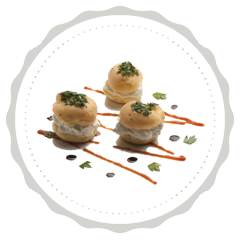 Using two tablespoons, form quenelles of spinach and use them to garnish the plates. 2 fillets Orata al Naturale, 4 slices Apulia-style bread, 1 garlic clove, 200 g cherry tomatoes, 100 g mixed green and Taggiasca olives, zest of a lemon. Toast the bread golden brown. Rub the peeled garlic clove over one side to flavour the bread. Arrange the bruschettas in the middle of the plate and put a gilthead bream fillet on each slice. 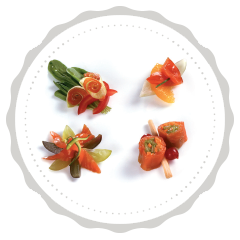 Thread alternating tomatoes and olives onto brochettes and place one brochette next to each fillet. Garnish with a lemon zest julienne and a drizzle of extra-virgin olive oil. 1 Fil di Fumo fillet, 200 g Savoy cabbage, 1 Tropea onion, extra-virgin olive oil, lemon, salt, pepper. Finely slice the cabbage and onion and steam them, adding a drop of oil, salt and pepper. Arrange the steamed vegetables on a plate with the hot Fil di Fumo fillet. Dress with oil and lemon. 300 g Fil di Fumo, 1 garlic clove, 1 tomato, 1 small bunch parsley, 100 g extra-virgin olive oil, 100 g tomato sauce, 1 spirits glass of cognac. Chop the garlic and parsley, gently cook in the oil, add the diced hot-smoked trout and diced tomato, pour in the cognac and allow to evaporate. Add the tomato sauce and allow to boil for about one minute. 1 Fil di Fumo fillet, soy bean sprouts, datterini tomatoes (or baby plums), black olives, capers and pepper. 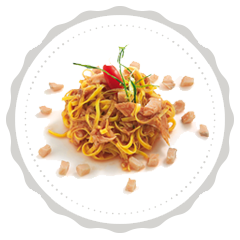 Arrange the bean sprouts on the bottom of a plate with the black olives and the finely sliced datterini tomatoes. 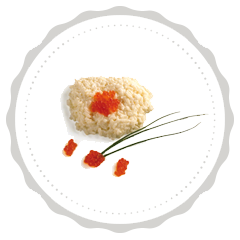 Place the room-temperature or heated Fil di Fumo fillet on top. Garnish the plate with a few capers and freshly-ground pepper. 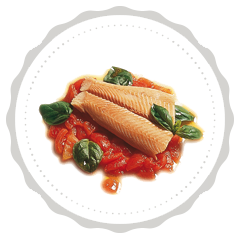 4 fillets Fil di Fumo, 260 g tomato flesh, 8 basil leaves, ½ shallot, 4 tbsp extra-virgin olive oil, 2 garlic cloves, salt, white pepper. 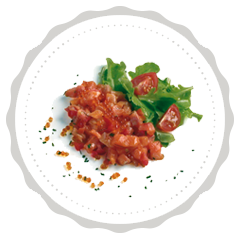 Tip the diced tomato flesh into a bowl, add the basil, 3 tbsp oil and season with salt. Heat 1 tbsp oil in a saucepan and gently fry the shallot, add the tomato mixture and cook for 5 minutes. 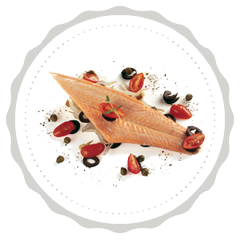 Heat the hot-smoked trout fillets in a bain-marie, spoon the sauce onto warmed plates, arrange the Fil di Fumo fillets on top and finish with fresh basil leaves and white pepper. 4 Fil di Fumo fillets, 100 g black olives, 3 large potatoes, 1 garlic clove, 1 sprig thyme, a few leaves of flat parsley, salt, pepper, 3 tbsp extra-virgin olive oil. Peel the potatoes and cut them into a cylindrical shape then cut into 1cm-thick slices. Pour the oil into a saucepan, add the thyme, black olives, parsley and a generous splash of water, cook the potato slices in this sauce for about 6-7 minutes, season with salt and pepper. Heat the Fil di Fumo fillets in a bain-marie. 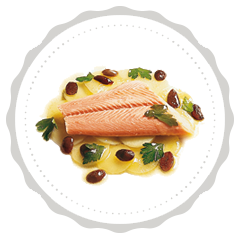 Arrange the potato slices in a circle on a warmed plate and place the hot-smoked trout fillets on top. Drizzle over the slightly reduced sauce. 12 slices Carpaccio di Trota, 200 g mixed salad leaves, 2 dl fresh single cream, chives, salt, pepper, 1 lemon, extra-virgin olive oil. Juice the lemon and add the juice to the cream to make sour cream, add the finely chopped chives. Dress the salad with oil, vinegar, salt and white pepper. 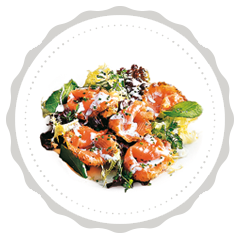 Arrange a bed of salad leaves on a dinner plate, place the trout carpaccio slices on top then drizzle over the sour cream. 2 fillets Branzino al Naturale, 2 eggs, 250 g fresh whipping cream, 125 g sliced mushrooms, 250 g mixed mushrooms (cep, button), salt, pepper. Heat 1 tbsp oil in a frying pan with a garlic clove, gently cook the 125g sliced mushrooms, adding a generous pinch of chopped parsley for the last minute. Leave to cool. Whiz the cooked mushrooms in a blender with the eggs and cream. Adjust the seasoning. Divide the mixture among 4 well-buttered foil ramekins. Place the ramekins in a roasting tin and pour in an inch or so of boiling water. Bake the mushrooms in the oven at 130°C for 45 minutes. Trim the other (250g) mushrooms, wash them and cut into chunks. Sauté them in a frying pan with a drizzle of oil and a garlic clove, salt and pepper. 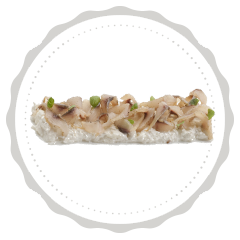 Turn out each ramekin onto a plate, arrange the sea bass steaks on top and complete with the sautéed mushrooms.